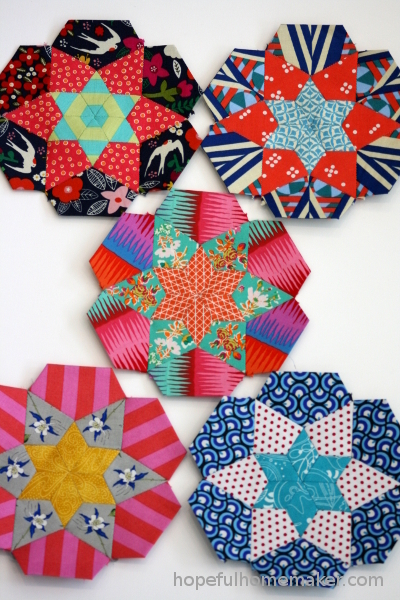 I shared my first ever English Paper Piecing (EPP) blocks earlier this year, and now there are ten of them. The block, designed by Jodi of Tales of Cloth, is called Ice Cream Soda and it’s been a great learner project for me. 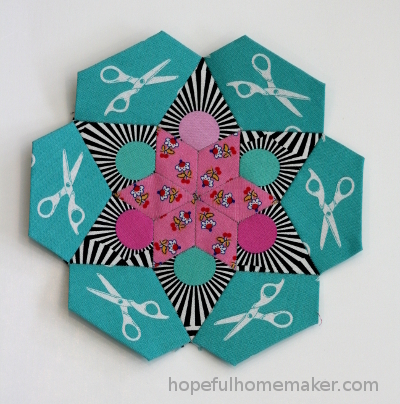 I continue to use this project to practice fussy-cutting, both by showcasing certain images and also by using the fabric to create repeat designs as the sections are sewn together. This is not a natural thing for me (it makes me cringe a little that fabric is wasted) but I do feel that with practice I am getting better at seeing new ways to use prints. I am also trying to pull out favorite prints and include them. I did this with a particular print that is out of print and precious to me. I was so proud of myself for cutting into it and now I can’t find those block pieces anywhere! I remember doing it and have searched high and low but cannot find them. They were with the rest of the blocks I cut out at the same time and how one of them went missing is beyond me. I really hope it turns up somewhere! Such a bummer. 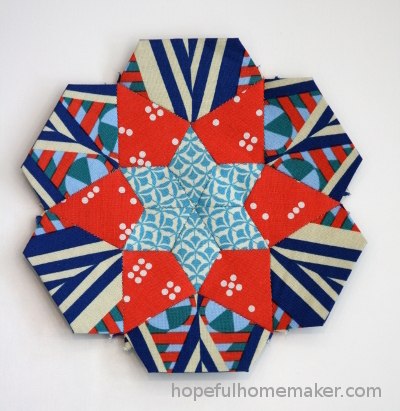 When I last posted about this project I had tried two different methods of sewing the pieces together. I liked the way the flat back stitched pieces looked (because I couldn’t see any stitches) but I just couldn’t seem to hold them together firmly enough and my points were off. It was also slower. So I have gone back to the method of holding right sides together and carefully stitching along the edges. The stitches are more visible but I am a little quicker. On this project I believe the title “slowest sewist” is appropriate. The schedule for the stitch along says I should have most of my blocks done by now, but I just finished the first month’s blocks. Lots of slow catching up lies ahead, and that’s ok. 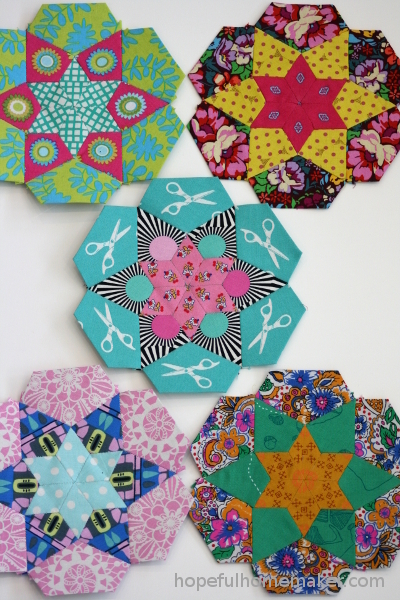 I am making these blocks to improve my skills in preparation for making a La Passacaglia quilt. When I put the blocks together like this I feel excited, like maybe I”ll actually have an ice cream soda quilt top that I like when I’m caught up on all this stitching! At this point I have no plan regarding color other than to use lots of it. 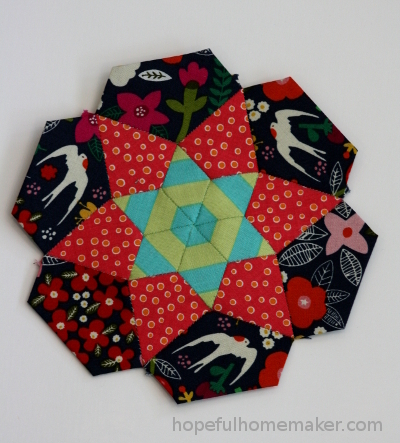 I figure I have plenty of time and blocks to go and I’ll be able to adjust as necessary along the way.